I am a huge fan of basil. A HUGE fan. My basil was slow to start this year but as temperatures have risen, it’s taken off. In recent years, I’ve found that even with just one prolific plant, you can use it just about every day and still arrive at the end of the season with some leftover. If you’re in that boat, here are a few of my favorite uses for basil. Pesto is the best sauce for pasta dishes. It spells perfection. My favorite pesto recipe comes from the Vitamix cookbook. It’s as easy as combining ½ cup of olive oil, ½ cup of parmesan cheese, 3 cloves of garlic, 2 cups of fresh basil leaves, 3 tablespoons of pine nuts, seasoning with salt and pepper, and blending for a minute. I love to make a bunch, use some for a meal, and freeze the rest in ice cube trays for later. I’m actually borrowing this one from my wife. She’s a huge fan of bruschetta. A great bruschetta starts with toasting slices of a French baguette and topping with a mixture of diced tomatoes, chopped basil, a little garlic, olive oil, and a splash of balsamic vinegar. Enjoy it as an appetizer, or if you’re really in the mood for comfort food, make it the main dish. There are many different iterations of caprese salad online. 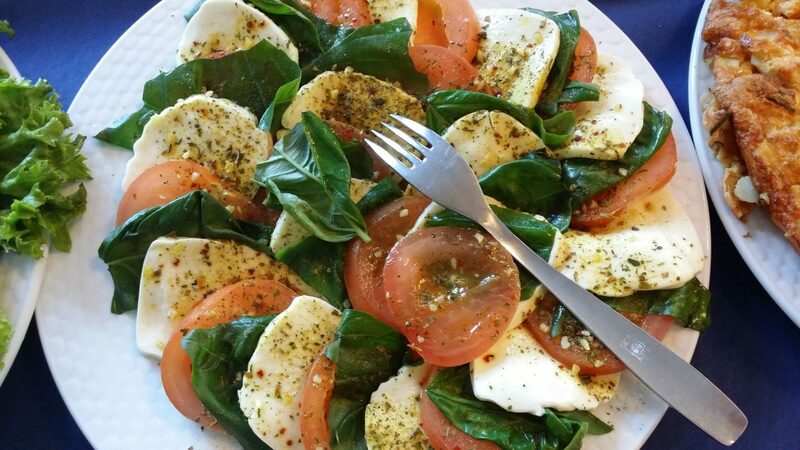 I prefer to keep it simple, stacking sliced tomatoes, basil leaves, and sliced, fresh mozzarella cheese. Top that with salt, pepper, and drizzle it with extra virgin olive oil. This recipe from All Recipes gives instructions for creating a balsamic vinegar reduction to add the perfect flavor accent to this fresh dish. If you’re still looking for ways to use basil, keep in mind that you can use it for just about every meal. In the morning, add chopped basil to your eggs. For lunch, add it to your salad for a delicious flavor complement to the other leafy greens. For dinner, add it to pasta dishes, homemade pizzas, or rub it on meat. It’s so versatile! Now I ask you– what are your favorite uses for basil? Share a recipe with us in a comment or on Facebook or Twitter.